Following are the Networking Basics Interview Questions presenting here are collected from various students, professors, websites. 21. Define the terms Unicasting, Multiccasting and Broadcasting? If the message is sent from a source to a single destination node, it is called Unicasting. If the message is sent to some subset of other nodes, it is called Multicasting. If the message is sent to all the m nodes in the network it is called Broadcasting. Multiplexing is the set of techniques that allows the simultaneous transmission of multiple signals across a single data link. 23. Name the categories of Multiplexing? ii. ASynchronous TDM Or Statistical TDM. FDM is an analog technique that can be applied when the bandwidth of a link is greater than the combined bandwidths of the signals to be transmitted. WDM is conceptually the same as FDM, except that the multiplexing and demultiplexing involve light signals transmitted through fiber optics channel. TDM is a digital process that can be applied when the data rate capacity of the transmission medium is greater than the data rate required by the sending and receiving devices. 27. What is Synchronous TDM? In STDM, the multiplexer allocates exactly the same time slot to each device at all times, whether or not a device has anything to transmit. 29. Which layers are network support layers? 30. Which layers are user support layers? 31. Which layer links the network support layers and user support layers? The Transport layer links the network support layers and user support layers. 32. What are the concerns of the Physical Layer? Physical layer coordinates the functions required to transmit a bit stream over a physical medium. 33. What are the responsibilities of Data Link Layer? The Data Link Layer transforms the physical layer, a raw transmission facility, to a reliable link and is responsible for node-node delivery. 34. What are the responsibilities of Network Layer? The Network Layer is responsible for the source-to-destination delivery of packet possibly across multiple networks (links). 35. What are the responsibilities of Transport Layer? The Transport Layer is responsible for source-to-destination delivery of the entire message. 36. What are the responsibilities of Session Layer? The Session layer is the network dialog Controller. It establishes, maintains and synchronizes the interaction between the communicating systems. 37. What are the responsibilities of Presentation Layer? The Presentation layer is concerned with the syntax and semantics of the information exchanged between two systems. 38. What are the responsibilities of Application Layer? The Application Layer enables the user, whether human or software, to access the network. 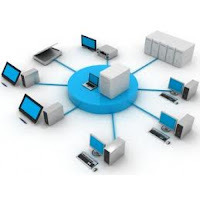 It provides user interfaces and support for services such as e-mail, shared database management and other types of distributed information services. 39. What are the two classes of hardware building blocks? 40. What are the different link types used to build a computer network?